A model wearing the technology. GROUNDBREAKING NEW TECHNOLOGY has allowed doctors to hold simple conversations with patients who are “locked-in” and have been too disabled to communicate. 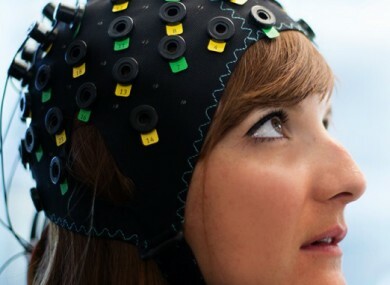 A newly developed brain-computer interface permits people who otherwise have no means of communicating to engage in simple “yes” and “no” conversations. According to the authors of a new study published in the journal Plos Biology, the technology has the potential the revolutionise the lives of patients and could be “the first step towards abolition of complete locked-in states”. A complete locked-in state (CLIS) is when a person is suffering from complete motor paralysis and is so unable to communicate in any way. However the brain function of the person is still intact, meaning that they can perceive the world around them. In the study, three women and one man (aged 24 to 76) were trained to use the interface by doctors asking them simple “yes” and “no” questions and asking them to answer. All four suffered from CLIS due to the fact that they had ALS (amyotrophic lateral sclerosis) – a progressive motor neuron disease that leads to complete destruction of the part of the nervous system responsible for movement. The four are fed through feeding tubes and cared for at home by their families. Questions like “Your husband’s name is Joachim” and “Berlin is the capital of France”. Over time, the cap learned to distinguish between the blood flow patterns in the patients’ brains whether a “yes” or “no” answer was being thought. The questions became more complex as the technology was used. When questioned were they “happy” with life, all four patients answered “yes”. In another case, a family requested that the researchers ask one of the participants whether he would agree for his daughter to marry her boyfriend ‘Mario’. The answer was “No” nine times out of ten. Professor John Donoghue, Director of the Wyss Center, who developed the technology, said it hoped to expand on the results of the research. “Restoring communication for completely locked-in people is a crucial first step in the challenge to regain movement,” he said. “The Wyss Center plans to build on the results of this study to develop clinically useful technology that will be available to people with paralysis resulting from ALS, stroke or spinal cord injury. The technology used in the study also has broader applications that we believe could be further developed to treat and monitor people with a wide range of neuro-disorders. Email “Groundbreaking technology allows completely paralysed 'locked-in' patients to communicate”. Feedback on “Groundbreaking technology allows completely paralysed 'locked-in' patients to communicate”.